This is one of the smallest of the common ‘scripture’ lichens and may require a microscope squash to satisfy the experts. Fieldcraft, however, shows it grows well on smooth areas of old, shaded, acid-barked trees. The discs (lirellae) look like black dashes split down the middle and are arranged in clusters. They develop on a grey-brown thallus reaching 2.5mm in length. Little scattered dots (pycnidia) are also present. 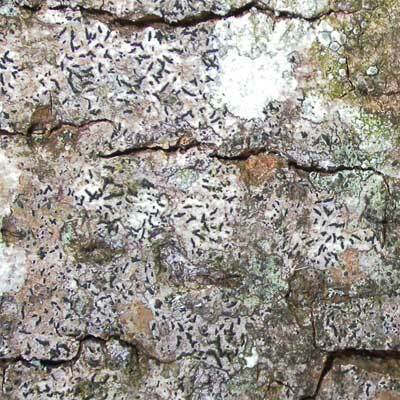 Its nearest lookalike, O. niveoatra, has discs less than half the size of this species and grows on trees with a more basic bark such as ash and sycamore. Mostly on smooth, shaded bark but avoiding basic bark of trees such as ash, sycamore and field maple. Simms, M. J., (2016). Opegrapha vulgata (Ach.) Ach.. [In] LichenIreland.